Meanwhile, in 2-quart saucepan, stir together milk and pudding mix; cook as directed on package. Continue cooking over low heat while adding chocolate chips, stirring until melted. Set aside. In medium bowl, beat cream cheese, powdered sugar, peppermint extract and 1 to 2 drops of the green food color until smooth. Gently fold in 1 cup of the whipped topping. Spread cream cheese mixture in shell. Top with chocolate mixture. Refrigerate at least 2 hours until set. To color remaining 1 cup whipped topping, in small bowl, stir together whipped topping and remaining 2 drops food color. 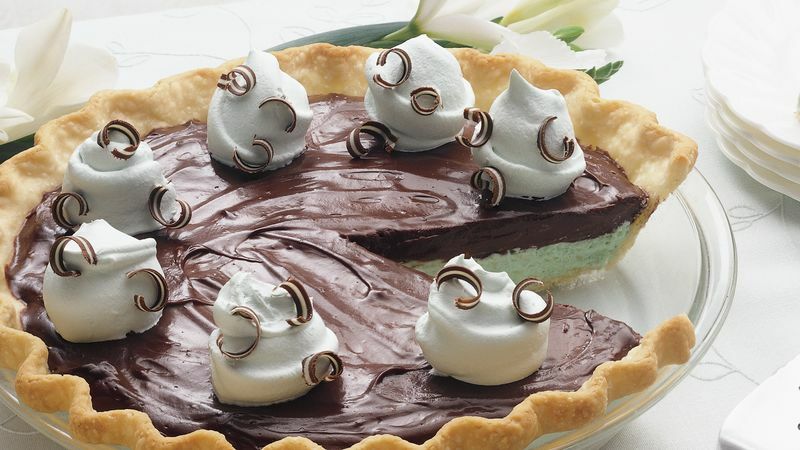 Garnish pie with whipped topping. Chop mints and sprinkle over whipped topping. Cover and store in refrigerator.